This bag will make your diapering routine chic as never before! Use it for diapers or for laundry, camping, boating, etc. It is endlessly and wonderfully versatile. A totally practical accessory in our fun and crazy Super Brite fabric. Intended to be used either as a hanging diaper pail or as a great-fitting diaper pail liner. 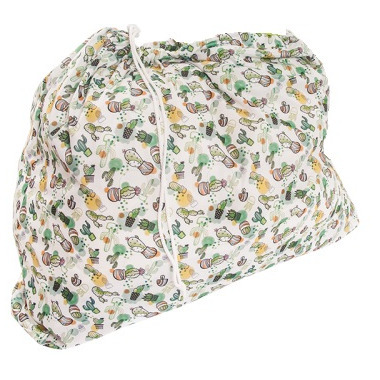 You can wash and dry it with your diapers - high heat will not damage this sturdy polyester bag with a tough waterproof layer. Double seamed on three sides, designed and constructed to be durable and leak resistant. We love this bag! It holds tons of soiled diapers, is waterproof, and keeps the stink in. Plus, the cactus print is so cute!